Had a neat thing happen Saturday, 7/23/2011! Dave Woodson and Kirby Ricketts, of the Trenton, MO Kiwanis Club came to Joplin to present checks and a car to Ed McDaniels. Ed was a firefighter with the Joplin FD, who was injured last year while providing emergency assistance while he was off duty. His injuries resulted in him being unable to work as a firefighter. However, since he was off-duty when injured, he was only eligible for half the pension he would normally have received. On top of that his wife died last November following a long illness. Ed had to let the insurance on his house lapse because of the rising rates. Then came to tornado . . . . . . . .
Dave was in Joplin shortly following the tornado and became acquanted with Ed at that time. When he returned to Trenton he and the Trenton Kiwanis Club raised $1731 for Ed. And Dave had a car he was going to donate to Ed as well. This is how Dave and Kirby arrived in Joplin. Obviously, Dave has his own body shop, so he was uniquely equipped to deliver cars. Here you see Dave Woodson (on the left) and Ed McDaniels. Dave has just handed Ed checks totaling $1731. 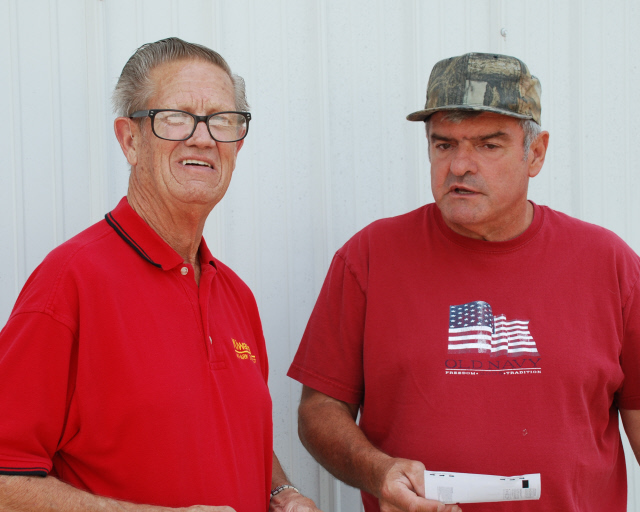 Although Dave had planned to donate a car to Ed, he found out the day before he left for Joplin that Ed had just managed to acquire a vehicle, and no longer needed one. 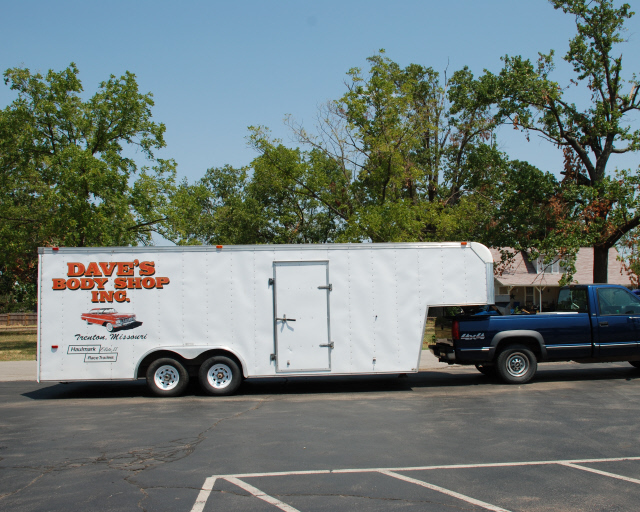 Dave felt that there were many others in Joplin who could use a vehicle, so he brought it along anyway. 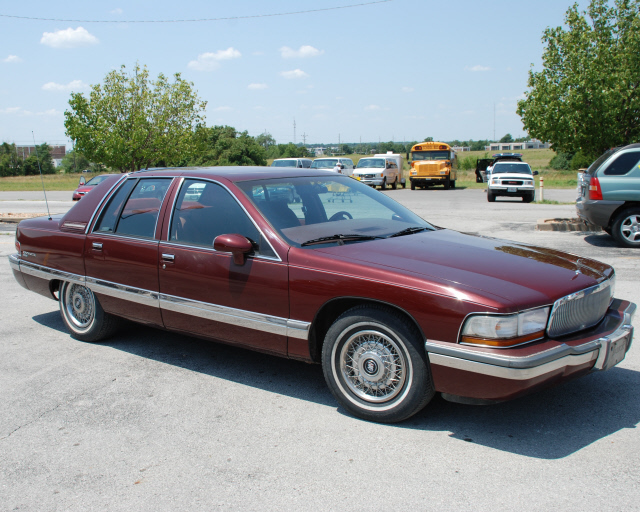 Not exactly new, a 1992 Buick Roadmaster, but in good shape with lots of miles left on it. Dave gave it a coat of paint before bringing it to Joplin, and Kirby Rickets, who was camera shy and has a spray-on bed coating business, fixed up the Landau top. Looks pretty sharp from a distance. We took the car to the staging center at College Heights Christian Church. They were happy to get it, and promised it would be welcomed by another Joplin citizen. Dave Woodson was the Kiwanis MO-Ark District Governor in 2002-2003, and is a past president of the Trenton Kiwanis Club. He will also be the Trenton Club president-elect in October. Copyright © 2006 Kiwanis Club of Joplin, MO. All Rights Reserved.